Robins flourish in human-altered landscapes and play a key role in transmission of West Nile virus in much of North America. Photo by Bruce Lyon. Culex pipiens mosquitoes thrive in urbanized environments and play a major role in West Nile virus transmission in urban areas in the northern half of North America. Photo by Joseph Hoyt. After its initial appearance in New York in 1999, West Nile virus spread across the United States in just a few years and is now well established throughout North and South America. Both the mosquitoes that transmit it and the birds that are important hosts for the virus are abundant in areas that have been modified by human activities. As a result, transmission of West Nile virus is highest in urbanized and agricultural habitats. West Nile virus can infect a wide range of animals, including more than 300 species of birds and 60 species of mosquitoes. It also infects mammals, reptiles, and even amphibians. But researchers have found that in most places only a few key species of bird "hosts" and mosquito "vectors" are important in transmission of the virus. "We now know that in any given location, only one or two species of mosquitoes play a big role, and only a handful of birds appear to be important in overall transmission rates," said Kilpatrick, who reviewed a decade of research on the ecology and evolution of West Nile virus in a paper published in the October 21 issue of Science. 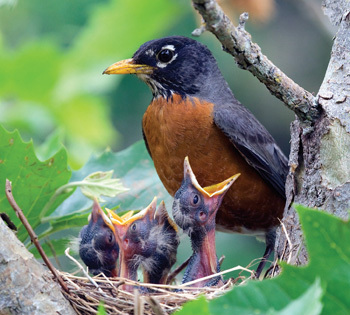 According to Kilpatrick, the familiar American robin plays a key role in the transmission of West Nile virus across much of North America. It is such an important host species that Kilpatrick calls robins "super-spreaders" of West Nile virus. The reason is not so much the abundance of robins, but rather the feeding patterns of the mosquitoes that transmit the virus. The mosquito species important in transmission seem to prefer robins over other, more abundant species of birds such as house sparrows. "Robins are more important in transmission than their abundance alone would suggest," Kilpatrick said. "The peculiar feeding habits of the vectors play a really important role in transmission, and this idea applies to many different diseases. It's one of the really interesting things we've learned from the past decade of research on West Nile virus." Insights gained from research on West Nile virus could help public health officials deal with other introduced diseases in the future. "The spread of disease-causing organisms is likely to only increase in the coming years," said Sam Scheiner, director of the Evolution and Ecology of Infectious Diseases program at the National Science Foundation (NSF). "West Nile virus has provided a test of our ability to respond to such spread. This research shows that predicting disease incidence in humans and other animals is more complex than first imagined, but that greater understanding of such complexities is possible--knowledge that can be applied to the next threat." The globalization of trade and travel has spread many invasive species, including infectious pathogens like West Nile virus. Although its exact route of entry to New York is unknown, West Nile virus may have arrived in an infected mosquito carried across the Atlantic by an airplane, Kilpatrick said. The virus then adapted quickly to its new environment, evolving a new strain that was transmitted more efficiently by local mosquitoes than the introduced strain. By 2005, the new strain had completely displaced the introduced one throughout North America. Three species of mosquitoes are key vectors for transmitting West Nile virus in much of North America. Interestingly, these mosquitoes are not among the species that feed frequently on people. They are bird specialists that happen to bite people often enough to cause human infections. 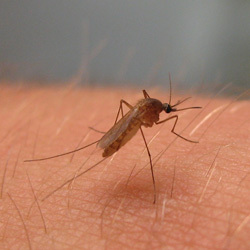 "The mosquitoes that bite humans most are actually not as important in transmission of West Nile virus to humans because they rarely bite birds and thus rarely get infected in the first place," Kilpatrick said. "Instead, it's the species that feed mostly on birds and frequently get infected, but occasionally feed on people, that are most important." Millions of birds have died from West Nile virus infection, with dramatic effects on the populations of some species. Crows, for example, are much less abundant than they were before the virus arrived. The robin population, which had been growing rapidly, has leveled off. "Robins were on a steady upward trajectory thought to be linked to human land use--they love lawns and agricultural fields," Kilpatrick said. "Crow populations were growing even faster. Now crow populations have crashed downward and robins have leveled off, and we suspect that's due to West Nile virus." The worst human outbreaks of West Nile virus in the United States occurred in 2002 and 2003. According to Kilpatrick, it's not clear whether the reduction in human disease since then represents a long-term trend or short-term variability. "It may be that with climatic conditions favorable for the virus we could again get very intense years of transmission," he said. "We don't know yet how much of the year-to-year variation can be explained by climatic conditions or other factors, such as acquired immunity in birds or humans." Many other diseases caused by mosquito-borne or tick-borne viruses could potentially be introduced to the United States from overseas, Kilpatrick said. Understanding the ecology of these viruses may lead to strategies that could prevent a newly introduced pathogen from establishing itself as successfully as West Nile virus has. Kilpatrick's research on West Nile virus is supported by grants from NSF and the National Institutes of Health.